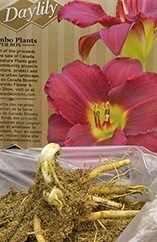 Greater selection of mail order plants, seeds, bulbs and garden products. The convenience of armchair shopping. Seeds, plants and garden goods shipped right to your door. Better selection is the big reason to buy plants online. For example, an online rose specialist will offer scores of varieties and types of roses, while your local garden center can only afford to stock perhaps a dozen or so. Few garden centers are big enough to stock a fraction of what’s available, so web suppliers or mail order catalogues are the best way to find plants and garden products that are difficult to find locally. Dutch Gardens Shop at Home: Lots of plants to choose from – perennials (lilies, irises, roses, daylilies); summer bulbs (dahlia, canna, gladiolus, begonia); spring flowering bulbs. Ships to continental US. Richters Herbs: Offers an excellent variety of seeds, culinary and medicinal herb plants and ornamental plants. You’ll find seeds that are hard to get: for example, they carry the smaller marigolds such as the attractive orange, lemon and tangerine Gem series. Ritchers prides itself on delivering herb plants in great shape. I’ve always been impressed with the healthy condition of their plants after shipping. Shipping to Canada and US. Canadian company, ships to US government inspected, with phytosanitary certificate free of charge. Gardener’s Supply Company: Offers a wealth of tools and supplies for gardeners, from seed-starting to watering, fertilizing and weeding, even garden furniture and sheds. Good garden tips too. Ships to US only. Be sure to order early to avoid “sold out” notices. Because seeds and planting stock are produced at least a season in advance, quantities are often limited, so it pays to order early. If you don’t want substitutions, state this clearly on your order form. Many mail-order companies will substitute a similar item for a sold-out product. Usually there’s a box to check if you prefer no substitutions. Read and understand the company’s guarantee policy. Most suppliers have a date by which you must a notify them about problems or plant failures to get your money back. Read the fine print. When you buy plants online, check the size of plants shipped. It’s discouraging to pay top dollar for something that comes in a tiny pot. Keep a record of orders and shipping dates. You don’t want to order same tulip bulbs twice because you misplaced the original order.